John Falland manufactures and supply a rage of Wine and Grape handling Equipment including Grape Bins, Wine Barrels Racks and related products. 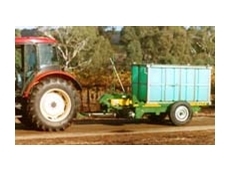 John Falland Australia has been operating for over 50 years. 10/03/11 - Agricultural and industrial machinery specialist Ashmore Engineering, introduce their Binmax and Bin Buddy grape trailer series.